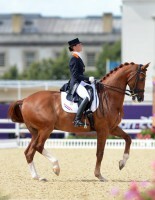 Adelinde Cornelissen and Parzival (pictured at the 2012 London Olympics) didn't finish their Grand Prix test in Rio. Photo by Kat Netzler. Dutch rider Adelinde Cornelissen elected to stop Parzival in the middle of their Grand Prix test today at the Rio Olympics, thus ending her chances of further competition at these Games. Cornelissen said the 19-year-old gelding was ill yesterday, but she’d hoped to still provide a score for her team. “It started yesterday morning,” she said. “I came to the stable, and his cheek was completely swollen. It appeared that he was bitten by a spider or a mosquito or whatever, so his body was full of toxic fever. [We] managed to get that down yesterday, he was nine hours on liquids, and then yesterday evening it was all good. Temperature was down again this morning also. Cornelissen was the first of the Dutch team’s four riders to go, and they still have Hans Peter Minderhoud on Johnson, Edward Gal on Voice, and Diederik van Silfhout on Arlando set for competition. See full results on the Rio website.